‘Brisbane played without heart’, said Roar coach Rado Vidosic, after his team was taken apart in a twelve-minute spell in the second half of the match with Melbourne Heart at AAMI Park on Friday. In that time Heart scored three times to turn a precarious one-nil lead into a drubbing. Yet prior to that phase Brisbane had pinned Heart back in its own half, dominating possession for long spells, yet not managing to break through to equalise. Things might conceivably have turned out otherwise had Henrique been credited with a goal in the 40th minute of the first half. 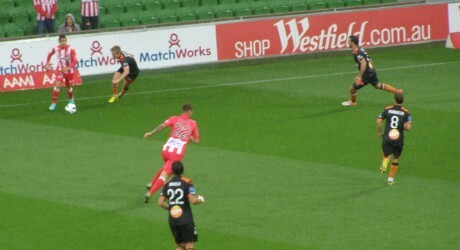 Mitch Nicholls pursued a ball to the bye-line and squeezed it past Clint Bolton for Henrique to knock it into the net. Replays suggested the whole of the ball might not have crossed the line before Nicholls sent it goalwards, but the camera angle which would have settled the matter—either along the goal line or from overhead—was not available. The assistant referee was in good position to judge close to the corner-flag and his decision stood. Heart was without inspirational skipper Fred and Jason Hoffman came into midfield while Nick Kalmar was asked to play wide on the left in the place of Ben Garuccio, who is on duty with the Young Socceroos as is David Vrankovic. Fred was keen to play but the club would not risk his hamstring this week. Vince Grella will have a couple of games in the youth team and then see if he is ready for first team football. 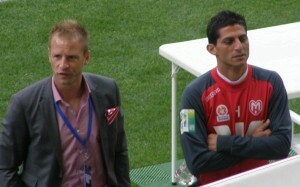 Brisbane were without Besart Berisha whose mystery injury or illness has still not been diagnosed. The early exchanges were quite even and bth sides had chances to score. Josip Tadic played in Mate Dugandzic after eight minutes but the Brisbane keeper Michael Theo was alert to break and sprinted off his line to block the winger’s effort at the expense of corner kick. Brisbane’s passing game took the ball through the Heart midfield, with Thomas Broich, Mitch Nicholls and Massimo Murdocca prominent, but neither side could turn chances into goal until the 20th minute. Heart came down the right and Josip Tadic released Mate Dugandzic whose cross was turned in at the near post by defender Patrick Gerhardt, wiping out the memory of his own goal last week. Brisbane nearly got on terms in 31 minutes as Erik Paartalu shot narrowly wide after some excellent build up work. Then came the Henrique disallowed effort and so the interval came with Heart still a goal to the good. The first fifteen minutes of the second half was all Brisbane and Heart players could do little more than block the runs and kick the ball clear. It was usually returned pretty rapidly by the Roar, but they could not buy a goal. Nick Kalmar was withdrawn in the 61st minute and David Williams took his place for Heart. Josip Tadic then tried an overhead kick which just flew wide as Heart began to come back into the match. Tadic put Richard Garcia through on goal and the Socceroo clipped the ball past Michael Theo in the 62nd minute. Garcia was involved again eight minutes later as he was brought down by Matthew Jurman as he tried to cut across the penalty box. Jurman had been booked in the first half and was lucky to stay on the field, but Tadic stepped up and buried the penalty kick. Brisbane mounted a series of attacks trying to get something out of a game which had got away from them, but Heart rebounded after a Brisbane free kick by Thomas Broich as hacked clear. Aziz Behich chased down the loose ball out on the left wing. He caught it just inside the touchline and quickly sent David Williams clear. Williams emphatic shot flew past Theo into the far corner. Broich fed Ivan Franjic on the right and he crossed for Henrique to score a consolation goal for the visitors, but that hardly dampened the Heart’s fans celebrations. 1. Michael Theo, 2. Matt Smith, 3. Shane Stefanutto (19. Jack Hingert 83’), 4. Matt Jurman, 5. Ivan Franjic, 6. Erik Paartalu, 8. Massimo Murdocca (18. Luke Brattan 65’), 10. Henrique, 11. Ben Halloran, 17. Mitch Nichols (24. Nick Fitzgerald 69’), 22. Thomas Broich,.